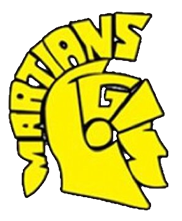 The Martian defense posted their second shutout of the season behind 13 tackles from Jake Lederman (2018) 12 from Drake Toms (2018) and 11 from Aaron Moore (2109). Colby Phipps (2019) returned a blocked punt in the first quarter as Goodrich scored on the ground, through the air and on special teams. Tylor Leedom (2020) helped lead the offensive attack by throwing for 137 and a pair of touchdowns to freshmen Tyson Davis (2021). Joe Toporek (2018) opened up the scoring for the Martians with a 16 yard touchdown run in the first quarter, Toporek finished with 96 yards, Spencer King (2018) had a pair of touchdowns and Hunter Haffner (2019) was 6/6 on PAT’s.